Tuesday night, as part of the incredible line up of activities that Kravet arranged for Blogfest, we were invited to preview the Elle Decor Modern Life Concept House. Ten designers created fabulous spaces in two apartments at this new premium condo development in West Chelsea’s art district. 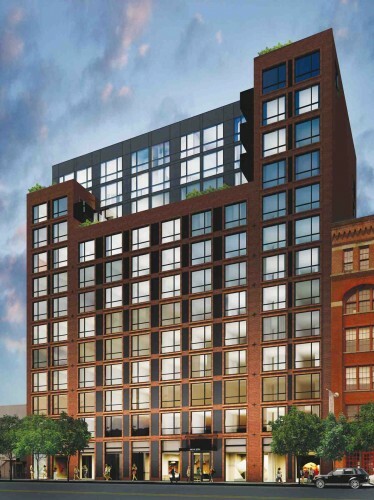 Overlooking the High Line Park and near dozens of galleries in this hot neighborhood, this project benefits Housing Works, the charity community dedicated to helpng people affected by HIV/AIDS. Here are a few of my favorites, snapped as we all made our way through the apartments. Jesse Carrier and Mara Miller, the husband and wife team behind Carrier and Company, designed this lovely living room with many pieces from Room and Board, but it was the fabulous tufted leather chair and ottoman from Mecox Gardens which help give the room its updated yet comfortable feel. They were a terrific juxtaposition against the light angular lines of the bookcases behind. And how gorgeous are these sculptural gold occastional tables from Lobel Modern. They added an element of warmth, glamour and a rough hewn quality to this eclectic modern space. 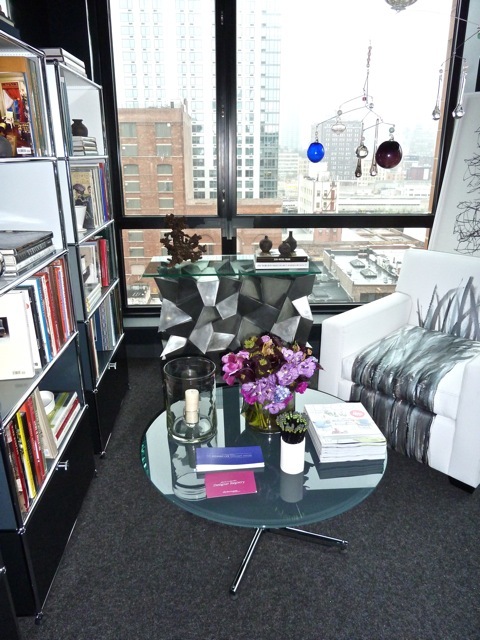 Oliver Furth‘s home office featured USM modular furniture which I had admired at the AD Home Show. It worked wonderfully with Craig van den Brulle‘s chunky cubist metal console. The kitchens came equipped with cabinetry, countertops and fixtures. 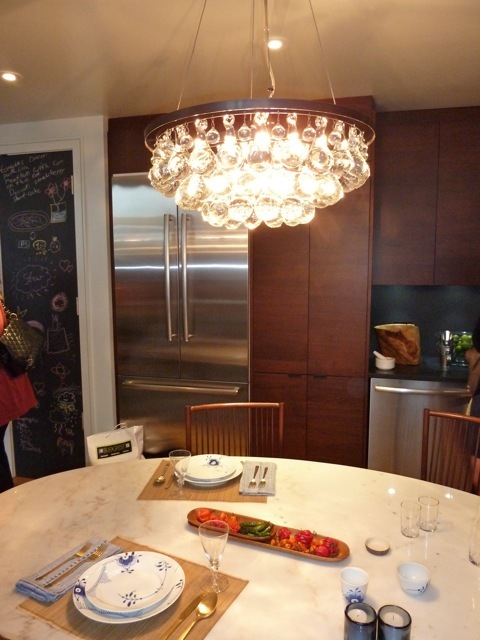 Katie Lydon put her stamp on this space with stainless Bosch appliances and this exquisite light fixture from Ochre. 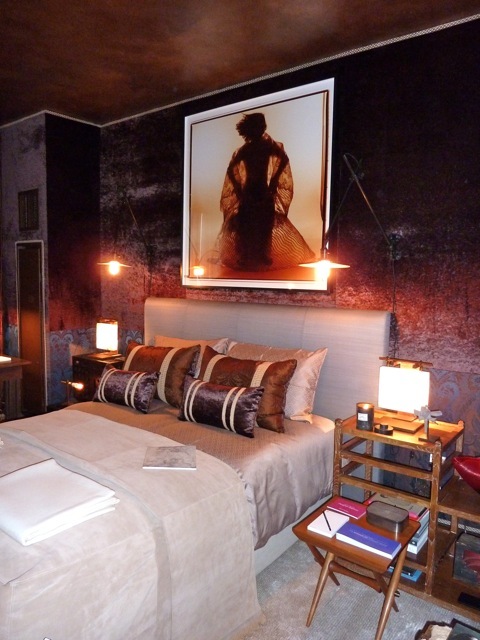 Marie Turner furnished her elegant bedroom with pieces from Lema. The room was sleek and contemporary yet still elegant and feminine. I of course loved the pop of orange against the graphic black and white palette. Many of the chic accessories were from Etos as were the beautiful sconces (which I thought I had a shot of). 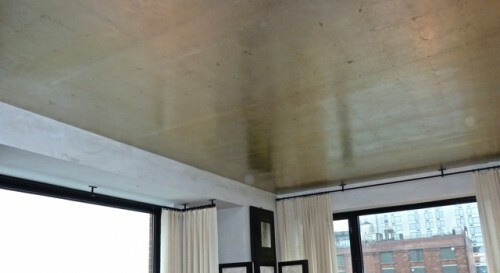 The gilded ceiling was the crowning glory which imbued the room with a glamorous reflective glow. 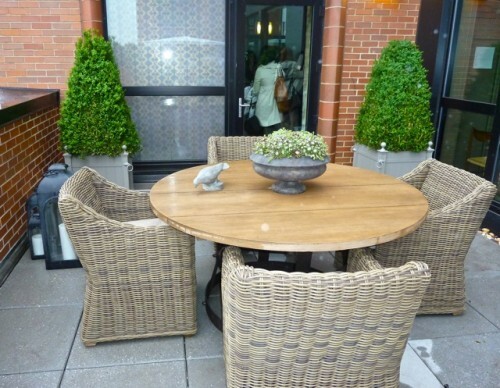 The second apartment featured a beautiful terrace designed by Amy Knox and Todd Nickey of Nickey/Kehoe. 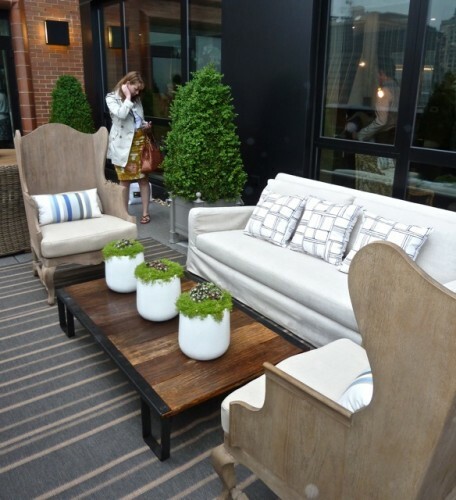 Most of the furnishings were from Restoration Hardware. 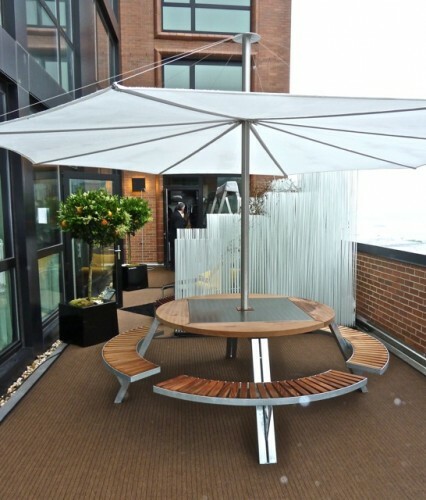 This casually chic outdoor living space dramatically increases the size of the apartment for at least three months of the year – what a total luxury in the city! I think I need a pair of those classic Versailles planters! Beth Martin‘s living room was an organic mix of modern and vintage feeling pieces. 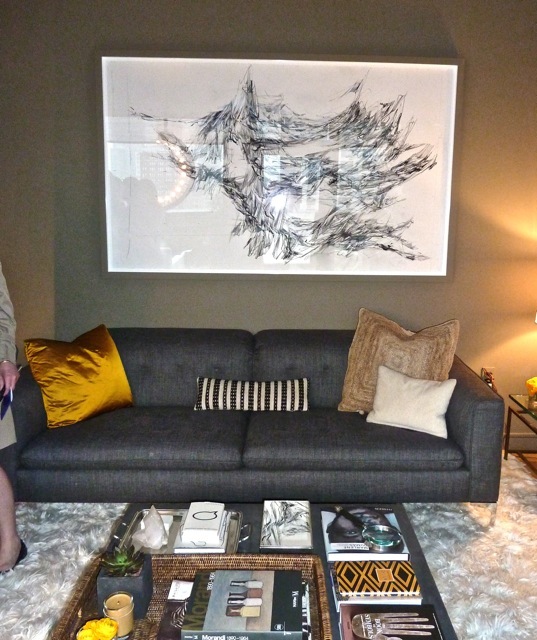 I love the pairing of the Calligaris sofa under the dramatic art by Christina McPhee. Interestingly, the other side of the room felt much warmer with a leather lounge chair from Almond Hartzog and Calligaris’ Horizon low TV bench, anchored by Jenny Phillips dramatic encaustic painting. Grant Gibson also used Bosch appliances in his kitchen and cleverly styled his space by using Chinese take out menus for the backsplash. I was dying for a taste of the delicious looking coconut layer cake. I’m afraid it was a bit difficult to photograph Aurélien Gallet‘s moody masculine master bedroom. Known for his refined yet unexpected combinations, Gallet successfully set the clean lines of a bed from Flou against the industrial Wyeth sconces. I was in love with the alabaster and steel side lamps from Maison Gerard. All the rooms were lovely but I have to say I was totally wowed by Sarah Story‘s incredible study. 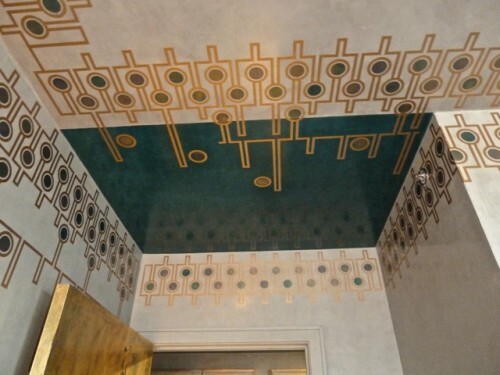 Her work began in the hall with the beautiful decorative painting of Judy Mulligan. 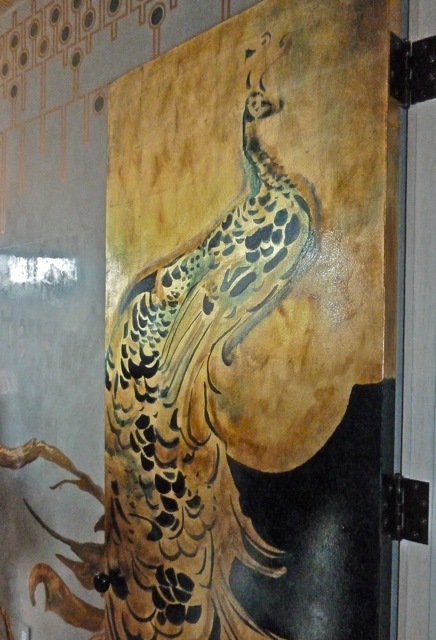 Then you entered through the amazing hand painted peacock on the door followed by the most glamorous Venetian plaster walls in a sumptuous shade of “stepped on” blue. The room had an exotic seductive appeal that really transported you to another place. I wish I had thought to shoot a separate picture of the amazing verre églomise panel on the left executed by Miriam Ellner. It has the most stunning translucent yet tactile appearance. In fact the entire room is all about the balance of texture, pattern and color. It was truly a visual feast. Daybed no. 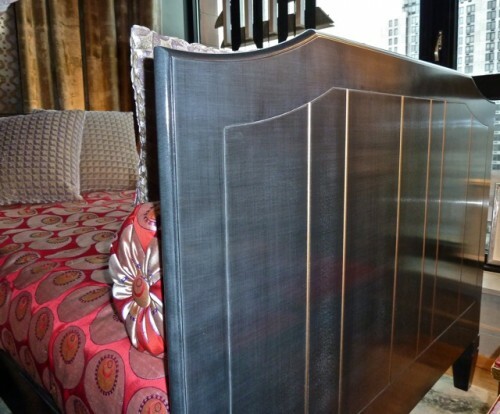 sixty-two from The New Traditionalists showed just how versatile their beautiful handcrafted furniture is. The splendid hand applied glaze and linen like brushstroke finish continued the textural story. Customization is a fantastic feature of their line that can transform their pieces to work with any style. And the subtle gilding added an elegant touch of glamour. The New Traditionalists’ classic Desk No. 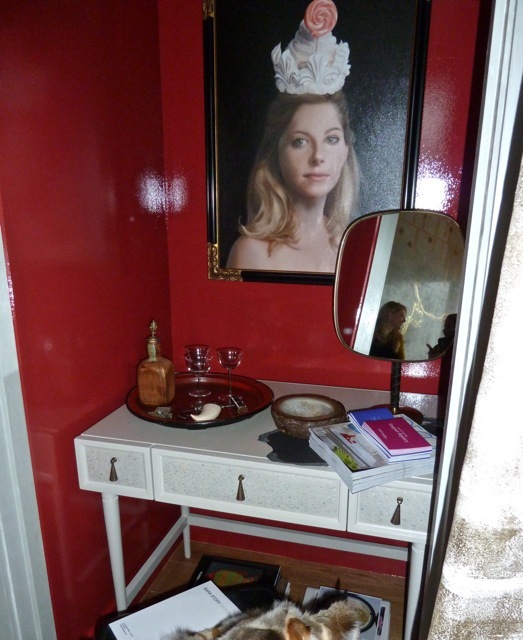 Two Eleven served as the vanity in a red lacquered niche. The incredible decorative painting extended to the ceiling where a bohemian inspired geometric pattern encircled the room. 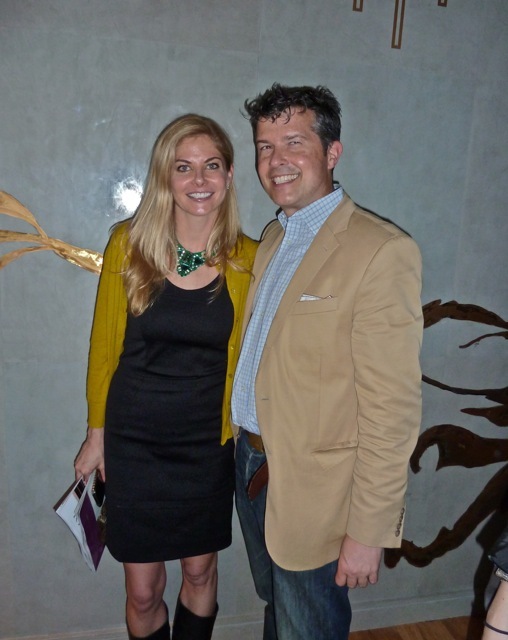 Here Sarah and New Traditionalist partner David Harris stand in front of the glass-like finish of the breathtaking Venetian plaster. This was a great venue on the Blogfest schedule. If you’re in the city, the concept house is open to the public on the next three weekends from 10 – 4. If you get a chance, it is worth a visit! This entry posted in furniture, interior design. Entry Tags: Elle Decor Concept House, Grant Gibson, Judy Mulligan, Marie Turner, Nickey/Kehoe, Oliver Furth, Sarah Story, The New Traditionalists Bookmark the permalink. Can I come back as you in my next life? You always attend the best events and I love your style of sharing so much goodness. I am with you….the study was a “wow” room and all the outdoor spaces were quite spectacular as well. I love that peacock, what a statement!! I’d get so much blogging done in that home office and cooking done in that kitchen – it was fun to have cocktails in such a great setting! I would gladly relocate to any of these! I love the leather chair and ottoman in the study, especially how the tufting comes down the sides. They certainly are glamorous spaces! Just when we think we’ve seen everything and are up to date–this shows there’s always something new and inspirational. Thanks for the tour! Was trying to keep up with my favorites but lost count. So much time obviously went into all of the rooms. True talent here. Thank you for sharing, q. 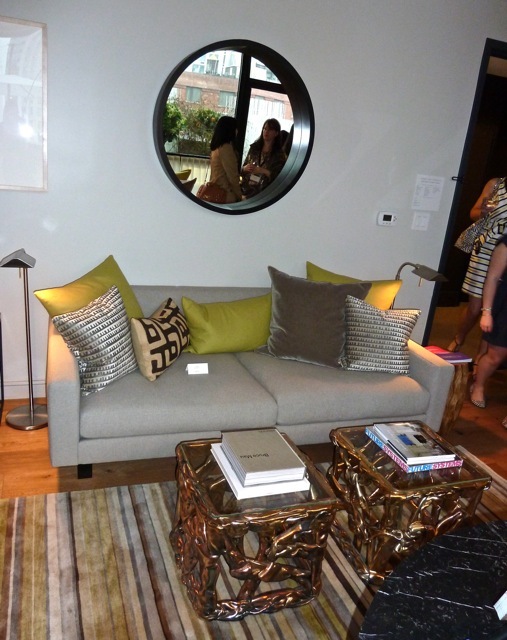 Always love a showhouse, where a group of designers come together for a cause! 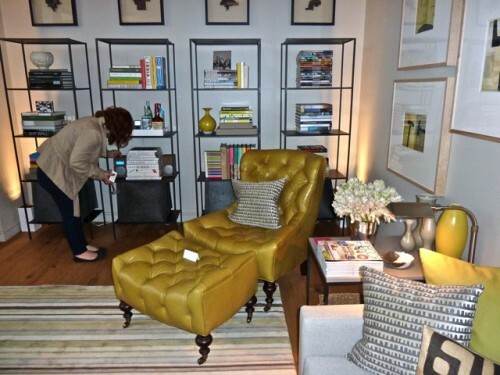 I adored Sarah Story’s room…definitely a highlight! This was a great, detailed post!! This is one of the most interesting spaces I’ve seen in a long time…so much to take in, must go back for several more looks! 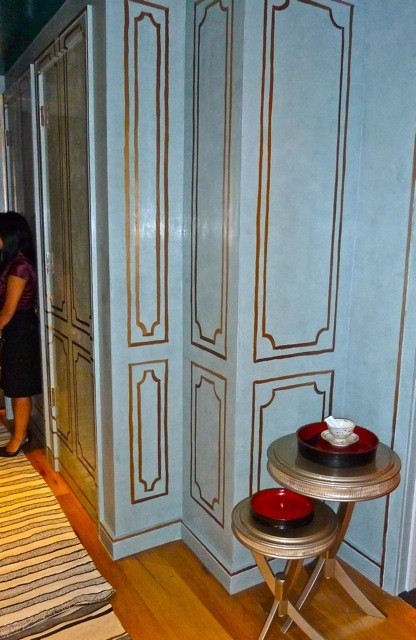 Wasn’t it fun to attend this showhouse? You covered it well! 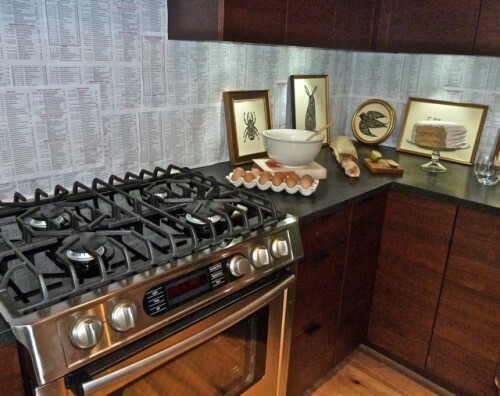 I loved Grant’s idea of using take out menus for the backsplash…having lived in the city that would have been fun! I don’t do take-out in the burbs, so it wouldn’t go over as well. I was happy to finally meet you. Will I see you on Tuesday? Great photos! Thanks so much for sharing. Seems like Blogfest was a blast! I would love to see these apts in person! Every room is so maginficient for different reasons. Hard to pick a fav. I am a Big fan of Sara Story. So creative. Sara Story is by Far my FAVORITE! can anyone tell me who the beautiful women figures are in her room? 81 queries in 0.645 seconds.